The veterinarians and staff at San Carlos Park Animal Hospital are ready to provide your pet with cutting edge veterinary medical care. From wellness exams and vaccines to advanced diagnostics and complex surgical procedures, your dog, cat or ferret will receive high quality care at our hospital. Do you know if your pet should be spayed or neutered? Do you know if any vaccinations are recommended to help maintain good health? Do you have questions about proper nutrition, cage cleaning, grooming, or any other aspects of care and husbandry? Our staff of skilled professionals is well trained in the care and husbandry of small animals and can give you the information you need to keep your cats and/or dogs looking and feeling great. Why not call to schedule a wellness visit? We can perform a physical examination, answer any questions you may have about your pet, and discuss whether any changes in diet or at-home care are recommended to help ensure the health and longevity of your pet. Veterinary medicine is growing as the popularity of these animals increases. When pet owners have access to the best information about nutritional and environmental management, exotic pets have a greater chance to live longer, healthier lives. If you own one of these unique pets, we encourage you to schedule a complete physical exam and consultation on proper care and feeding. Our trained staff can assist you with all of your small animal needs. Are you tired of wrestling with your pet when it's time for a bath? Are you nervous about trimming nails? Is regular brushing becoming a chore for you and your pet? Has your pet's hair become tangled, dirty, or matted? If you're looking for options when it comes to grooming your pet, why not come to us for your pet's next bath, nail trim, or haircut? 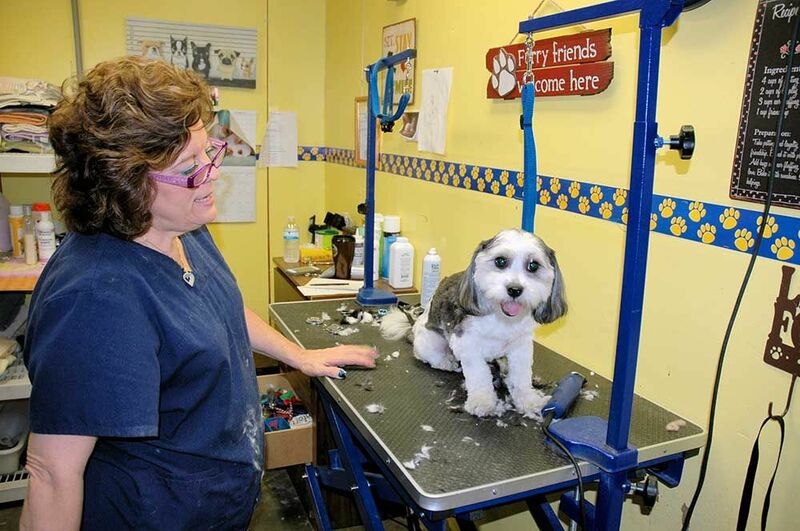 We offer a convenient solution by maintaining a clean, safe, high-quality grooming facility. When it comes to keeping your pet looking like a star, let us help you! Our professional and friendly staff will take great care of your pet's grooming needs. We understand that each pet is unique, and we will make every effort to keep your pet safe and comfortable during his or her grooming appointments. We'll treat your pet with compassion and care while making every effort to create a look you will love! Does your pet have special needs or skin problems? Do you have special requests? We understand that it can sometimes be challenging to find a groomer who will be gentle, take good care of your pet, and give your pet the "perfect" look. We take great pride in providing the highest quality services to each pet that comes to us for a grooming appointment. We welcome your questions about our grooming procedures and policies and are eager to discuss how we can make your pet's next grooming appointment as happy and stress free as possible  for both of you. If you have a young puppy or kitten, let's get acquainted early to help ensure that your pet will be comfortable with grooming throughout his or her life! Let us answer all your questions and put your concerns to rest. Call today to schedule your personalized grooming appointment with Jo-ann or Amy! Although humans and animals are different in many ways, some advances in human medicine are also very useful for veterinary patients. One of these advances, diagnostic ultrasound, has proven to be a powerful tool in veterinary medicine. As a practice, one of our goals is to offer state-of-the-art medicine and diagnostic testing; so we are pleased to offer ultrasound services as a means of providing a higher level of quality care to our patients. Ultrasonography is a type of diagnostic technique that uses ultrasound waves to produce an imaging study. This means that when we perform ultrasonography, we can see internal images of the patient’s body. Unlike some other imaging studies, like x-rays, ultrasonography does not use radiation. Instead, ultrasonography uses high-frequency sound (ultrasound) waves to create a picture of what is inside your pet’s body. Ultrasonography is a completely non-invasive, painless way to diagnose and evaluate many common diseases. An ultrasound machine generates ultrasound waves. The machine is connected to a small probe that is held gently against your pet’s skin. The probe sends out painless ultrasound waves that bounce off of structures (for example, organs) in your pet’s body and return to a sensor inside the ultrasound machine. The ultrasound equipment collects these reflected “echoes” and uses them to generate images that are viewable on a screen. Ultrasound waves can generate excellent images of abdominal organs, including the liver, spleen, gallbladder, and kidneys. It is also useful for assessing fetal health and monitoring pregnancy in breeding animals, and it can help us diagnose and stage (determine the severity of) some forms of cancer. Because ultrasound images are produced in real time, this technology can be used to evaluate the heart as it beats. This can help us detect abnormalities in the motion of heart valves, blood flow through the heart, and contractions of the heart muscle. It can also be used to assess the heart for defects. As we strive to provide our patients with the highest quality medicine and diagnostic testing, we are pleased to offer ultrasound as one of our diagnostic capabilities. Dental hygiene is an important part of your pet's health, because dental disease can be associated with other serious health problems such as heart disease and kidney disease. But how do you know if your pet has a healthy mouth? Let us examine your pet’s teeth and gums to help determine if there are any dental issues you should know about. After a brief visual examination, we may recommend a more detailed examination (which requires sedation), a dental cleaning, or options for at-home dental care. Sign up using the form below or contact us at 239-267-7711 to take advantage of this offer! Are you having problems caring for a terminally ill pet at home? Does your pet have a medical condition that is painful or causing poor quality of life? Are you afraid that your sick or elderly pet is suffering? Saying good-bye to a beloved pet is one of the most difficult situations a pet owner will ever encounter, but trying to decide when it is time to say good-bye can be even more difficult. There are times when all the capabilities of medical science have been exhausted and euthanasia is the only way to prevent an animal from suffering needlessly. However, the decision regarding when to euthanize is fraught with medical, financial, ethical, religious, moral, and sometimes legal considerations. Euthanasia is therefore a medical procedure that needs to be discussed (however painful that discussion may be) and considered thoroughly before a final decision is made. Let us help you through this difficult time. Our staff of compassionate, caring professionals can help you through this painful experience. We offer hospice services and will work with you to ensure your pet's comfort and dignity during his or her last days and final moments. Do you have special requests? Do you have questions about care of your pet’s remains? We can help you with these concerns and will make every effort to accommodate your wishes at this very difficult time. Deciding when your pet may need hospice care or euthanasia is a very personal and private decision, but that doesn’t mean you have to make this difficult choice on your own. Our hospice and humane euthanasia services are conducted with respect, compassion, and care. Before you struggle through one more day with a sick, elderly, or terminally ill pet that is suffering, call us to learn how we can help. We are very excited to have Companion Laser Therapy in our hospital! Please check out the You Tube video or give us a call to learn more about this amazing drug free, surgery free relief for your pet. We invite you to discover Bark Busters history and background as well as learn more about our natural and dog-friendly training techniques.